Vote for your chance to win Free Popcorn from Cineplex Odeon! 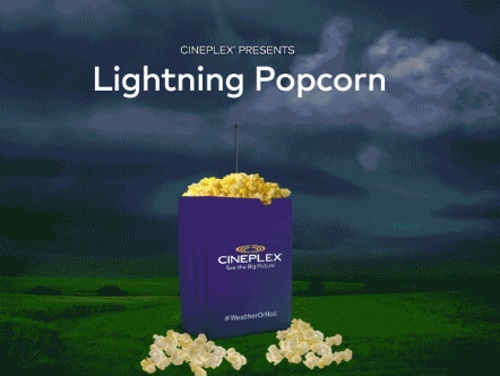 Cineplex built the world's largest popcorn bag, rigged with a giant lighting rod and placed it in a field near Windsor Ontario, the most lighting struck town in Canada. They don't know what will happen, whether or not it will pop or not if lighting strikes. Vote for what you think to enter the contest. The first 500,000 people who vote will get a coupon for a Free Small sized popcorn at Cineplex. Coupon will be sent to the email address used during the voting process on September 2, 2016. Coupon is valid September 5-9, 2016.